REBS website – Page 10 – Bonsai club founded in 1981, in Santa Rosa, CA. Dedicated to learning and promoting the living art of bonsai. Visit our website to discover more about the club. REBS members at our annual picnic on July 30, 2017. On Sunday, July 30, 2017, the club’s members and guests enjoyed our annual BBQ & picnic at the Lone Pine Bonsai and Gardens in Sebastopol. 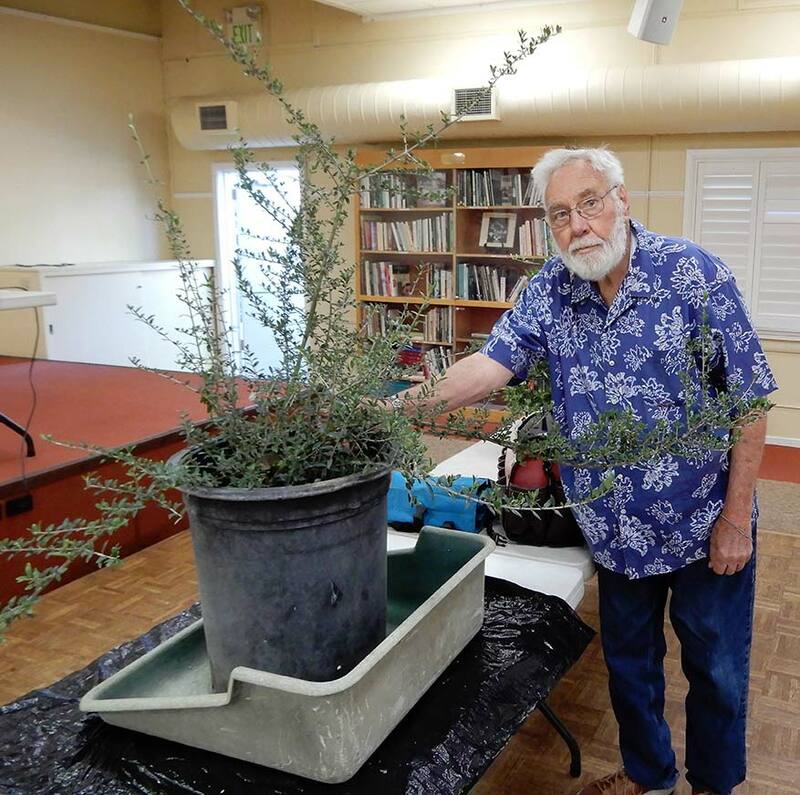 Ian and Janet Price have hosted the club picnic at their home and gardens since the founding of Redwood Empire Bonsai Society (REBS) more than 30 years now. The weather in July can be very hot, but on picnic day it was cool and pleasant. The picnic afforded time to relax, socialize, enjoy good food and family recipes. Bob Shimon and Ned Lycett prepared BBQ tri-tip and chicken that is always outstanding. Bob Shimon, Chief Chef, working the BBQ chicken. Ned Lycett, Back up Chief Chef, working with a new BBQ set. There was time to observe the Price’s gardens and bonsai nursery. Also, it was a good time to shop for bonsai and that perfect accent plant. The picnic comes every year about one month before REBS’ annual bonsai show. 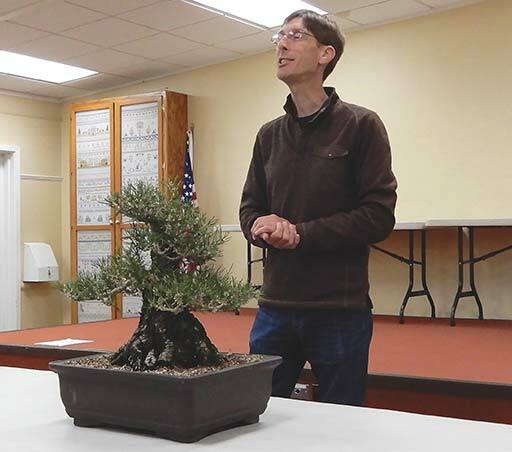 So, it was a good time to have a conversation about who is showing what, obtain member sale tags for selling bonsai related items and bring up the subject of show tree forms, which provide our club sensei Kathy Shaner with a photo and description of all the show trees to be put on display. There is still time to make your decision on which trees to display, which to sell or donate and complete the essential forms. This year we have a board meeting and general meeting before the annual show. These will take place on August 22, 2017, from 6:30 – 7:30 PM and 7:30 – 9:30 PM, respectively. That is a good date to set as a deadline for completing and turning over your forms. By the way, Kathy Shaner will be the demonstrator on August 22, and available to answer any questions you might have about the annual show. REBS members enjoying a plate of BBQ and family recipes at our annual picnic. Bonsai Display for the 63rd Enmanji Buddhist Temple Chicken Teriyaki and Bazaar. On Saturday afternoon, a small Redwood Empire Bonsai Society (REBS) contingency of members, led by Art Kopecky, met at the Enmanji Buddhist Temple in Sebastopol, California, in order to set-up a bonsai display in preparation for all day Sunday, July 9, 2017 63rd Chicken Teriyaki and Bazaar. REBS has been participating in the Enmanji Buddhist Temple’s annual event for many years. It is a wonderful opportunity to promote the art of bonsai and club membership. 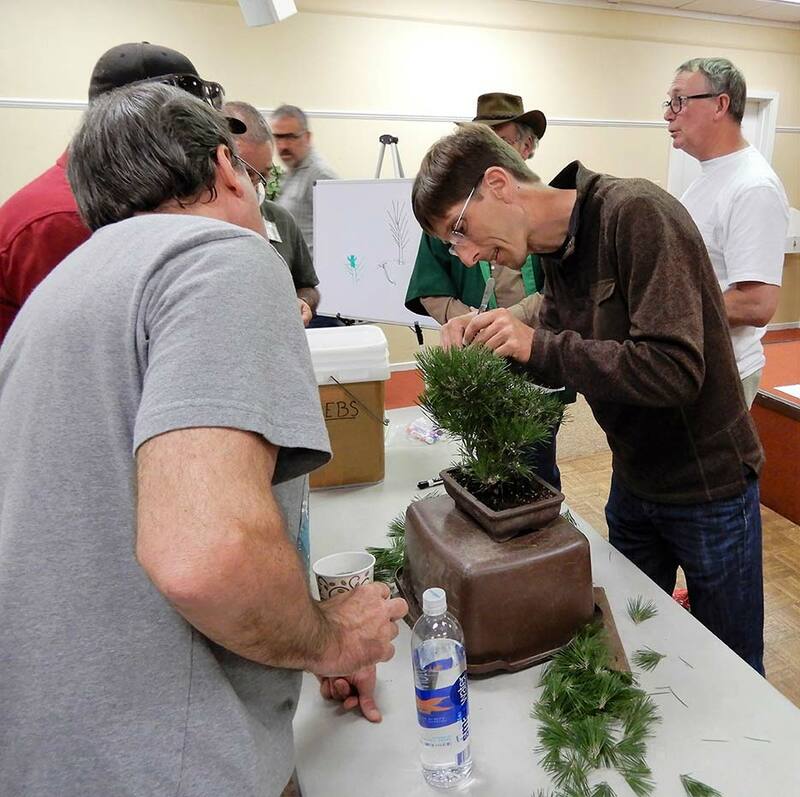 In addition, information is provided for REBS up-coming August 34th Annual Bonsai Show. The bonsai display is small, about 15 to 20 bonsai and additional accent plants. In addition, a working space is provided for the members to perform light work on their trees. 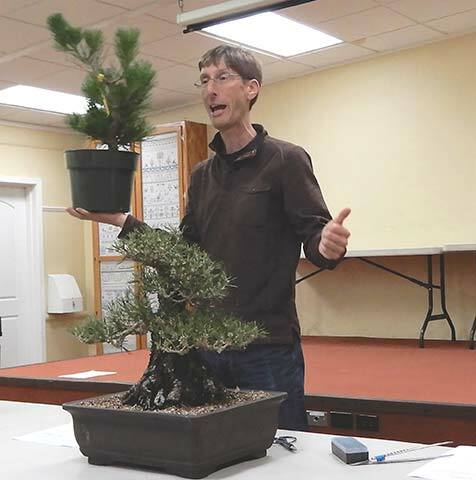 On June 27, 2017, Redwood Empire Bonsai Society (REBS) held its monthly meeting at the Luther Burbank Art & Garden Center, Santa Rosa, California, with guest bonsai artist, instructor and author Jonas Dupuich, who led a demonstration and discussion on the decandling of pines. Decandling was defined as the technique for the removal of spring growth (candles) from pines in order to stimulate a second push of growth in the summer months. The time period for decandling pines is in the middle of the growing season and dependent upon the weather and environmental conditions. For example, in the State of Washington decandling will take place in early spring (May, June), and in the State of Texas it would take place later in mid-summer (late June, July). In the San Francisco/Bay Area, decandling usually is done in early June and July. Timing relates to the amount of growing season remaining after decandling to help the second push of new growth. The Bonsai Garden at Lake Merritt opened its gate in 1999. Volunteers joined together through their hard work and generous donations to create a one-of-a-kind living art museum of legacy and master bonsai that is supported totally by volunteers and donations. Now we need help once again to revitalize the Bonsai Garden at Lake Merritt that is showing signs of its age and popularity. Please donate what you can to help us through the next phase of our journey together. 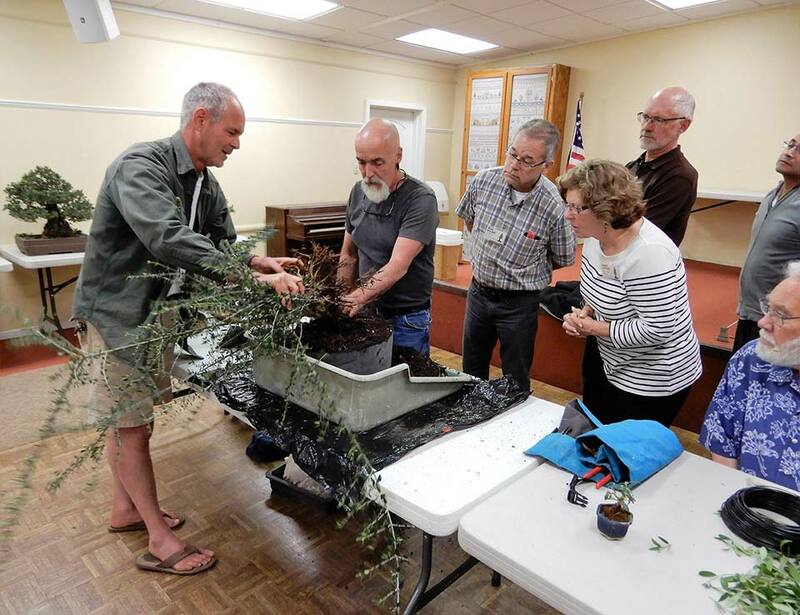 The Bonsai Garden has begun its GRO (Garden Revitalization Opportunity) project with funds from our reserves and a grant from the Golden State Bonsai Federation as well as contributions from organizations, individuals and bonsai clubs throughout Northern California. We also received a grant from the Walter & Elise Haas Fund that will help take us to our $100,000 goal, but we need your help to reach our goal. Please contribute online and come by to visit the Bonsai Garden at Lake Merritt to see how your contribution will help keep this museum open & admission free to the public. If you can’t stop by the Garden, please visit http://gsbf-lakemerritt.org. Update: Since January 2017, BGLM has raised 37% of its goal of $100,000. To date, new red cedar display benches and stands have replaced the original, worn out ones. Nearly two thirds of the new overhead water system had been completed. There are some ways to go yet. Installation of cement pavers for all the pathways and a new cul-de-sac is yet to be funded. And, more. 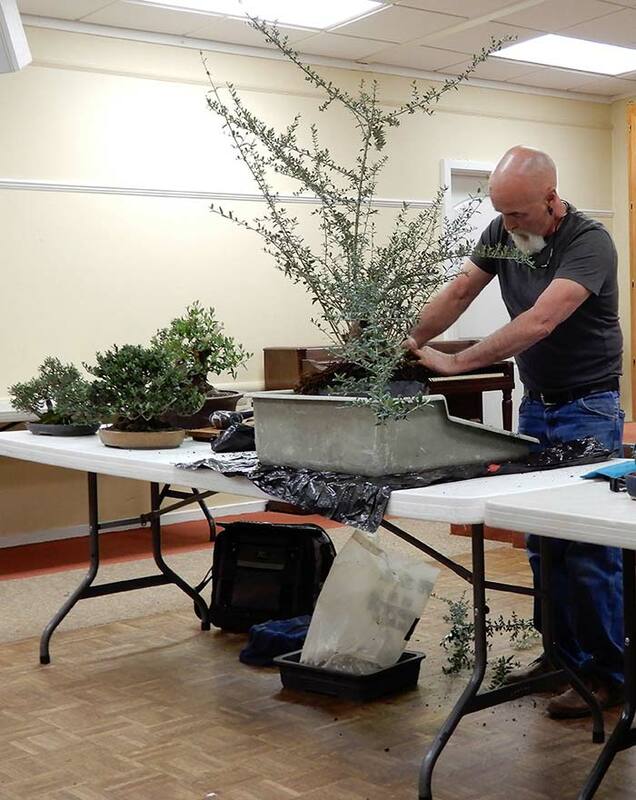 On May 23, 2017, Redwood Empire Bonsai Society (REBS) held its monthly meeting at the Luther Burbank Art & Garden Center, Santa Rosa, California, featuring members John Roehl, Ned Lycett and Ivan Lukrich on the subject of Olive (Olea europea) bonsai. John Roehl with the demo olive tree. Ned working on the demo tree. Position: Place the Olive bonsai outside and at a sunny spot, this also helps to reduce the size of the leaves. Must be protected during the winter if temperatures get too low. Feeding: Feed abundant, with a normal fertilizer monthly from spring to mid-autumn. Pruning: Strong pruning is recommended in late winter. The olive will respond with vigorous growth in the following spring. For maintenance pruning, cut back to 2-3 pairs of leaves, and in very vigorous (and healthy) specimens you can use defoliation. Repotting: Repot in spring before the buds begin to swell, every three or four years. Preferably use a bonsai mix with good drainage. Propagation: From seeds and cuttings. Ned working on removing large roots from the bottom of the root ball. The olive is commonly found in Mediterranean countries, where it is a tree with strong symbolic importance. You can use cultivated varieties for bonsai (like the common olive) but it is often to use the wild olive (Olea europea silvestrys). The wild olive is of greater interest for Bonsai as these develop tiny leaves. In many cases these possess much appreciated features like the presence of jin, shari and bark that indicate a high age and survival in hostile conditions. The Olive as bonsai is easy to care for and very strong so it is a suitable choice.